27th and 28th of May turned out to be two special days for me. 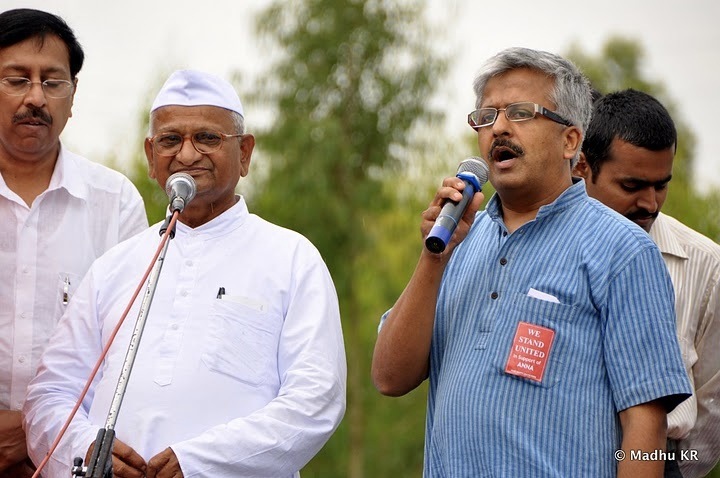 The volunteers of India Against Corruption had organized a series of meetings in and around Bangalore for the team of civil society members led by Anna Hazare. I was a part of these sessions and was with the entire team for these two days. Most of India today would have heard about Anna and his development experiment at his village Ralegan Siddhi. The extraordinary transformation that one man had made in the lives of these people over the last four decades was something that has been written about so much. But despite my admiration for his work and success, I was little prepared for the enormous impact that he left on me in the two days I was with him. Apart from rendering the keynote or introductory speeches, I was also asked to translate Anna’s speeches to Kannada. I was particularly impressed how he had also drawn inspiration from Swami Vivekananda and his writings. Swamiji’s writing not only inspired me to start the Swami Vivekananda Youth Movement, but his work and vision continue to inspire all that I am involved in today. Anna felt that Swami Vivekananda’s call of Nation Building was too strong to be ignored and that became the sole purpose of his life and mission. Leadership experts have written about the Crucible Theory and how a few learn from their own life experiences. These are special people who have experiences that many of us have, but are sensitive enough to not only learn from them but also make it life-changing for themselves and those around them. Anna was one such who made his surviving a lethal attack on his company in the 1965 Indo-Pak war into something that changed his thinking and life forever. Anna felt that he had been given a second lease of life to do something special. What touched me more than anything else was his sense of simplicity. Humility, humor and simplicity seem to come naturally to him and he enjoyed talking about the joy that he had received in serving others. He was genuinely puzzled that while people could stay happy and healthy by just serving society, they chose to be unhappy, disturbed and stressed because they ended up serving themselves and their own selfish causes. I also saw the master communicator in him. He was aware of his public narrative and he knew how to articulate and communicate it to the audience, like a seasoned politician. He was as shrewd as his opponents and knew how to use language, animation, content and style to sway his audience. What was refreshingly different was his lack of ego in talking about himself and his achievements and no hatred when he spoke of the people he disapproved. Anna is the ‘activist’s activist’. He showed a deep sense of outrage in anything that he saw as unjust and cannot be cowed down into silence whatever the personal consequences that he had to suffer. His explanation was clear and simple. He believed that a person who dies in the cause of serving man, society and the nation lived forever, while the one who lived in fear and for himself died everyday. His metric for success was equally simple. He spoke about his school that only admitted children who had failed at least once and whom other schools would not admit. A couple of them had even gone on to become doctors. His slogan was that if you can make a success out of failures, then you are worth your salt and your life should be regarded as successful. Sri Ramakrishna Paramahamsa had declared ‘As long as I live, so long do I learn’. Anna had a child like curiosity and was ever willing to learn. The spirit that he displayed at T.Begur – wanting to explore and learn more about the medical work being done at that village – was impressive. Greatness is in living the values that one professes. The gap between what we believe and how we live makes the difference between great and ordinary men. For Anna, there could be no such gap. He just had to walk his talk and live all that he spoke and believed in. He even jocularly remarked that he being completely married to the idea of national service left no place for marriage in his life. He could not even remember the names of his nephews and nieces. Such was his commitment to serving his village that he would not let any other personal distraction in. His Panchasutra (five fold message) to social workers was straight from his heart and experience – noble thoughts, noble deeds, blemish-less life, sacrifice and the ability to accept criticism. Great men like Gandhi and Vivekananda had led lives that are difficult to copy. Anna Hazare is also no exception to this but there are so many aspects of his life that one can aspire to imitate. While we cannot be completely like him, I am sure the Nation and the world will benefit if one aspires to do so. While he should not be made into the messiah that India seeks, he surely is someone who can unite and inspire Indians to lead themselves morally and give ourselves a country that we all deserve.